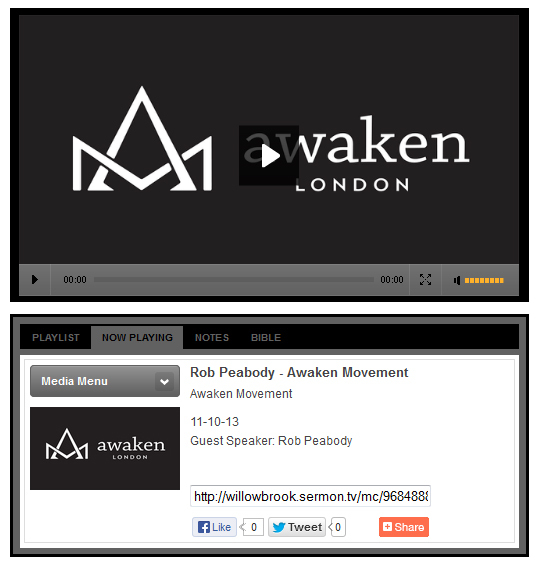 Watch Rob speak from Willowbrook Baptist Church in Huntsville, AL as he talks about his work with Awaken London & the Awaken Movement. Jump 13 mins into video to see him begin ... it's GOOD. When we set out to begin dreaming and writing for the Kingdom Rise project, there was something very special about the phrase that emerged as the title. The ideas of service, engagement, worship, action and justice as followers of Jesus were at the center - but, there was some much needed confession and repentance that needed to be dealt with in the areas of unity in the Kingdom, and it's fleshly arch-rival…competition. You see, I don't know if it is like this were you live, but often found deep in the underbelly of churches in the Bible-belt of America there is a spiritually deforming and non-Gospel centered issue (competition) that gets justified in an effort to reach more and more people for Jesus. To the average churchgoer, this typically lies unseen... But the deeper you get into leadership of a small group, congregation, denomination, or network of churches - and the larger that gets numerically- the more temptation arises to lead from a position of pride and ego… both of which have no place in the Kingdom of God. I know because this was me. "Those poor guys leading those small churches - they just don't get it." "If he was just a better preacher, more people would show up." "Have you heard their worship?" "That church is not relevant at all… they are so old school." I'm definitely not saying every large (or small church) leader in the Bible-belt deals with this, but what I am saying is that I personally feel this was an issue that many of the "successful" people in ministry I had the opportunity to get to know and work alongside struggled with. No judgment, just fact. Our Awaken team has been feeling ever more convicted that if we want to see revival and transformation in our cities in the name and power of Jesus, then confession and repentance of competition amongst brothers and sisters must occur. We have to surrender and get past this arguing, judging, prideful, competitive spirit before we can ever live in love and unity within our own family. What if we were truly and genuinely happy for the impact another believer is being used to make for Jesus? What if we prayed for them? What if impact for Jesus and His Kingdom was the evaluative measure for success in our communities and cities, not just our individual Christian Empires? Father, may your Kingdom Rise and our Empires fall. One of the most eye-opening realizations I have come to in my pursuit of worshipping Jesus is that all too often, more than I like to admit, I prefer to worship me. This morning I was reading this excerpt from a book, and it led me to confession. May it do the same for you today. If we are to be people whose lives are a sacrifice, there is no room for self-worship. "More of you (Father), less of me." Sacrifices, I don't want to have to make sacrifices. I want my plate full and my schedule empty. I want to be with people I like, people who are low in maintenance and high in appreciation. I want control over my time, my energy, my money, my things. I want my days to be predictable and my plans unobstructed. I want to experience success and successfully to avoid failure. I would rather be served than to serve. I would rather get the gift than to give. I guess this all points me to one stunning reality. There is never a day when my life is idol-free. There is never a week when I don't give myself to the worship of another. It is sad to say and humbling to admit, that the chief of these false deities is none other than me. I am the sovereign I want to serve. I am the king I want others to obey. I am the lord I want to rule my days. Yes, it is true, Dear Father, I want to be you. My dissatisfaction is not because you are not wise, faithful, loving, good, but because I do not get my own way. So, once more I bow, once more I make my confession, once more I plead for mercy, pardon, power, deliverance. Once more I ask, Dear Savior, Please free me from me and cause this selfish heart to find joy, satisfaction, motivation, delight, in doing the one thing I was given breath to do: offer myself as a sacrifice in the service of You. Rob is a featured guest blogger on Fusion UK blog, today. 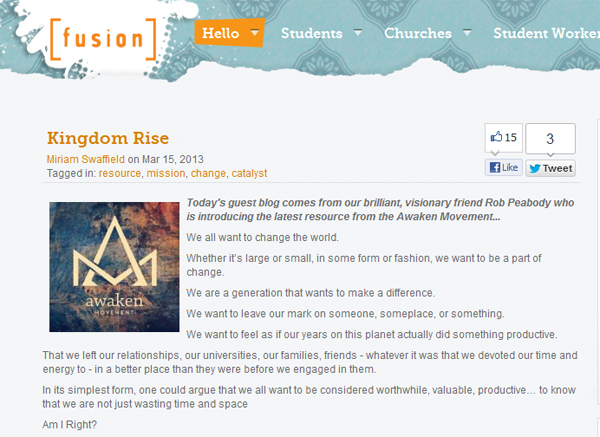 Go read what he has to say about the latest project, Kingdom Rise.